The Columbia Gorge oil train derailment has spurred calls to ban oil shipments through Oregon. But in 2013 concerns over the health impacts of the trains were waved aside as plans to transport coal and oil trains through Oregon went ahead. Multnomah County Health Department has issued a warning that coal trains could damage health. Low-income people and people of color are most at risk because they are more likely to live near train tracks. Photo: What if a derailment happened in Portland? 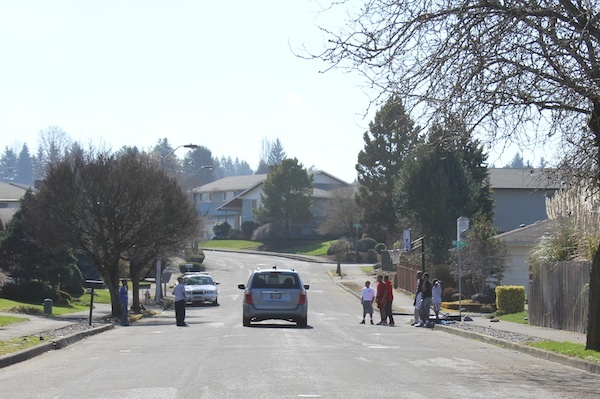 Trains roll through heavily populated neighborhoods in North and Northeast Portland, and in St Johns. How Many People Could Be Affected? One in nine Multnomah County residents, or about 82,000 people live within 500 meters of the rail tracks that could carry coal, and would experience some of any potential ill effects. "I stress potential ill effects," says Dr. Gary Oxman, a doctor working for Multnomah County. "Everybody knows that bad stuff comes from working in a coal mine. We have a lot less information on what happens to coal affected communities. Studies from Appalachia and England suggest that there are health impacts particularly on the respiratory system. But how much happens from train transports is not clear." The report predicts that people of color, poor families and the elderly would suffer the worst potential health effects, especially those living near train tracks in North Portland and St. Johns. That's partly because people of color already suffer higher rates of asthma, lung disease, strokes, heart disease and stress in general. And it's partly because higher numbers of those most vulnerable populations are living in the neighborhoods closest to the railroad lines. "A wide body of research has found that race and ethnicity are associated with health status -- independent of poverty status—because of stress, access to health care, and other factors," the report says. "The geographic areas of highest concern are located near the tracks by Columbia Boulevard and in North Portland neighborhoods (e.g.,Kenton and St. Johns). 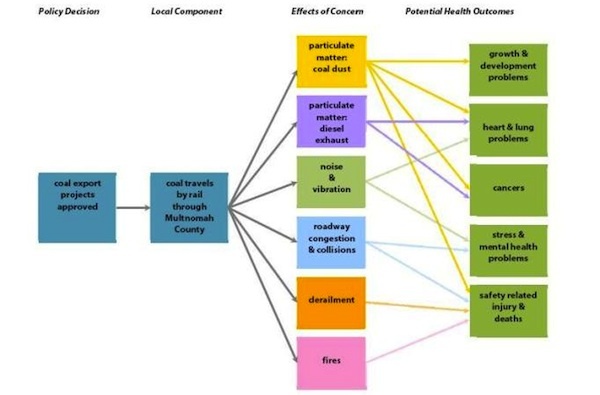 "Residents in some of these areas of concern are already exposed to relatively high levels of diesel particulate matter from living near major roadways and industrial areas. The social groups of highest concern are: communities of color, children, older adults, and people earning low incomes." Oxman says more data is needed, showing how much coal dust is likely to enter the air supply from trains. "We know coal dust is not good for you," he says. "What we don't know is how far the dust will spread, and whether people will inhale it in enough quantities to impact health." That mystery could be solved, he says, by conducting research studies. And that should happen before a decision is made. "From a policy point of view, before we start hauling coal through highly populated areas, it is the responsibility of the railroads and the other organizations involved to prove that it's not harmful." Plans to export coal through Oregon from the 400-mile wide Powder Mountain basin in Montana and Wyoming, were announced last summer. Between 16-19 more trains a day, carrying 125,000 tons of coal would pass through the county – a 19-20 percent increase in train traffic. Known health effects from coal, and also from the diesel used by coal trains, include harm to people's lungs and breathing. Asthma sufferers, that's 9 percent of the county's population, are particularly vulnerable. Other concerns include the impact on children's development. "Coal dust may contain traces of the heavy metals, such as lead, mercury, chromium, and uranium, that are toxic to the human nervous system," the report says. "Children are particularly vulnerable to heavy metals which can lead to decreases in birth weight and children's growth rate, and intellectual development problems." Image: The report included this visual of the risks to health from fuel trains. Links to cancer have not been proved, the report says, but more research is needed. Most of the research on coal has been done on people who work in mines and live in mining communities. Far less is known about the impact of coal transportation. The companies say that new technologies can prevent the dust from blowing into our air supply. But the report says no independent research has verified this, and the research that does exist suggests weather conditions, train speed and other factors are important. "Oregon Department of Environmental Quality, (predicts that) in 2017 the region's airshed will have on average more than ten times the level of diesel particulate that is considered safe," the report says. "However, in general, trains contribute a relatively small percentage (7 percent) of total diesel particulate air pollution in our region." Ambre Energy, Kinder Morgan, Peabody Energy, Arch Coal, and Cloud Peak Energy are among the companies that want to send coal exports through ports in Oregon and Washington. Coal is in high demand in Asia, as less developed regions ramp up industrial production. The report focuses on the three Oregon projects and does not look at impacts from coal barges traveling along the Columbia, or coal trains traveling along the Washington side of the Columbia Gorge. Projects in Coos Bay and St. Helens and a plant in Cowlitz County are among five port projects supported by a coalition of business and labor unions. Coal exports could bring jobs in construction, maintenance of the ports, railcar construction; and also yield increased tax revenues. Opponents say, however, that jobs in agriculture, fisheries and tourism, for example, could be lost if the environment suffers. Other problems that the report flags are: stress from noise and traffic snarlups; accidents, fires, and derailments. But the report also notes train safety has been improving. • What the immediate, cumulative, synergistic and long-term health impacts of this dust could be on a community."